The marmalade making season is now full on. I don’t need a whole cupboard full of Seville orange marmalade, just around 8-10 jars will keep me going throughout the year and a few jars for my Mum. 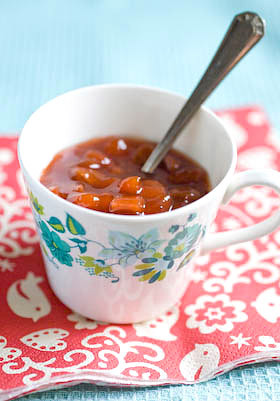 I have a couple of other marmalade recipes I like to make as well, so there is never a shortage in my house. 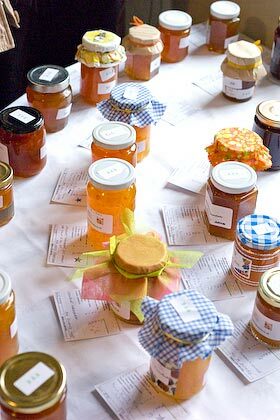 Last year I made my lemon, fig & lavender maramalade and pink grapefruit, rhubarb and cardamon , especially to enter in the Marmalade festival at Dalemain Mansion, Nr Penrith. The lemon, fig & lavender marmalade didn’t score too well at the festival, even though it has been a big hit elsewhere, has been chosen to be included in a canning book out later in the year in Canada, and provided the inspiration for a few other canners who tweaked the instructions to suit themselves but came back with a resounding thumbs up. 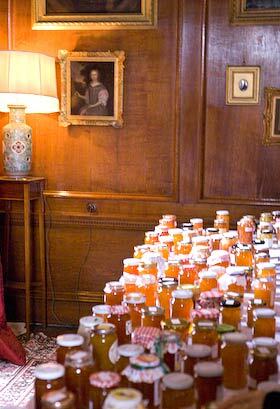 It is quite a robust marmalade and perhaps just wasn’t citrussy enough for the Dalemain judges. I did receive a little scorecard back after the event but unfortunately it has become lost in the mists of time on my desk, so I can tell you no more than that. 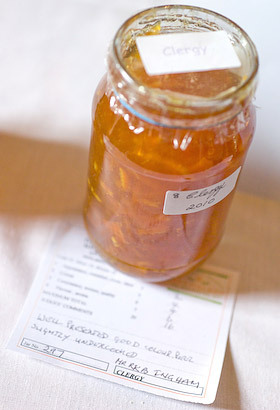 The pink grapefruit, rhubarb & cardamon marmalade did quite well in the ‘romantic’ category and has now become a running joke in my family as the scorecard said ‘nice try’. But it is the taking part that is important and Dalemain has become such a well publicised event for all sorts of worthy reasons that I would encourage anyone to participate and if possible go there and see what an extraordinary sight it is; tables laden with more jars of glowing amber preserves than you can possibly imagine in a grand English stately home setting. The event is now so well established that jars are sent in from all over the world, with entries from Japan, Australia and the US. Last year the tally was over 650 entries from amateur makers with a third of those entries being from men. In last years Clergy class, despite divine intervention, Mr Ingham was let down by his ‘peel slightly undercooked’. The categories have changed this year, so alongside category 1, ‘thin cut Seville orange marmalade’, category 6 has a ‘peers & political’ theme, and category 7 a ‘military’ vibe. I imagine the titles are open to interpretation, but last years ‘B & B’ category (not included this year) was for boarding house proprietors and ‘clergy’ (included again this year) is presumably for right reverends men (and women) of the cloth or their housekeepers. Anyway, I’m fancying category 11, ‘inventive’ and perhaps some trad thin cut Seville this year. You can find my recipe for this classic here. 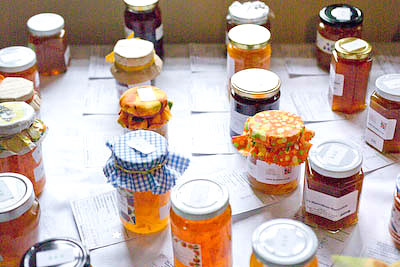 The Marmalade Festival at Dalemain Mansion, Nr Penrith, Cumbria takes place Saturday 12th & Sunday 13th February 2011 10am-4pm See their website here for more information and to download the form to accompany your entry, which needs to reach them by 6th February. The event is held in aid of the Hospice at Home, Carlisle and North Lakeland. 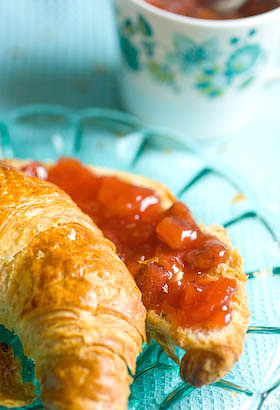 You can also find details on the website of special events taking place with Pam ‘the jam’ Corbin demonstrating how make the perfect marmalade and Dan Lepard, baker extraordinaire, showing how to make the perfect loaf to serve with it. 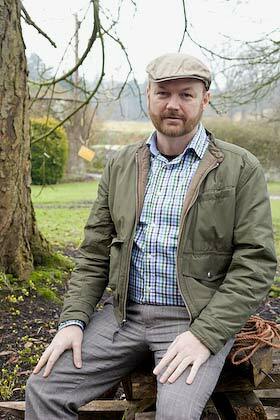 Dan Lepard, as country farmer amongst the aconites at Dalemain, 2010. Though parts of the country have had snowfall overnight, here in the Forest of Dean, it may be crisp and cold, but the sun is shining. I really must get my garlic planted today. 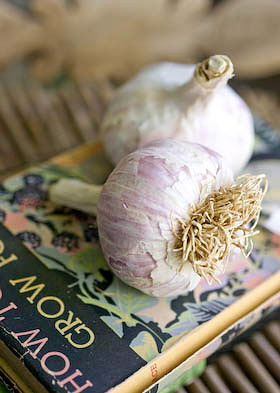 I bought two bulbs a month or so ago from Dobies; Garlic Vayo, a hardneck variety for Autumn planting, and was really pleased when the plump healthy bulbs arrived in the post. 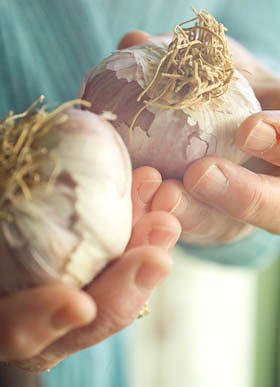 Hardneck garlic varieties need to be planted now so that they experience at least two months of the cold and frost they need to form their cloves. 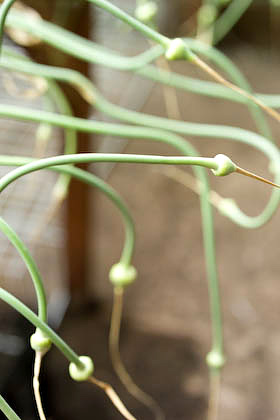 They are also the kind you need to grow if you want to be able to harvest garlic scapes, the winding flower stems they throw up that are a delicacy when pickled. I always associate garlic scapes with Elspeth Thompson. Elspeth, in case she isn’t familiar to you, was an amazingly talented and beautiful garden writer, who tragically died earlier this year. I can’t really call her a close friend but I did get to know her to some degree over the last few years. Elspeth lived a few streets over from me in Brixton and I knew which was her house, even though I didn’t know her. When I took on my first allotment, her book The Urban Gardener, a compilation of her weekly newspaper columns in the weekend Telegraph, became my bible and as it was written in a diary format, I could dip into it and look up the features that Elspeth had written about for a particular week. She was ahead of the game, always. She started to write about her allotment well before growing your own veg in the city became the most fashionable thing to do. I knew where her allotment site was and that she walked her dog in the park that I lived alongside. I knew people who were her friends but I never actually knew her. After I left London, one day out of the blue, she sent me an email asking me if I knew anything about pickling garlic flowers. She had eaten some at a wedding and thought they were fantastic. Wow, it is quite a thrill when someone you’ve admired from afar just happens to get in touch. Embarrassingly I knew ****all about garlic flowers but in true journalistic style I soon found out and sent her back lots of information. And so began our ongoing email correspondence. All my research was not for nothing. The flowers, actually known as scapes, are never found for sale in the UK so growing your own is the only way to experience them. So now is the moment when you need to get planting if you are to have scapes to pickle next year. 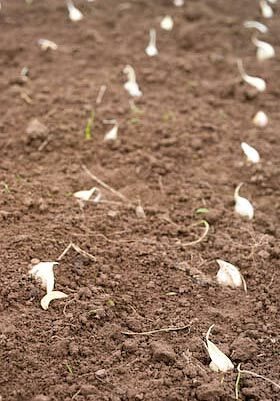 Choose a suitable hardneck garlic variety and plant the individual cloves in drills, 10cm (4in) apart with 20cm (8in) between rows. You can use a dibber to make holes to drop them in, making sure they are sitting the right way up with the root end underneath. Cover with 25mm (1in) of soil. You should have green garlic to lift next May/July and hopefully plenty of scapes to pickle as well. Dear Elspeth, you will always be in my thoughts as I plant garlic now and in the years ahead and admire jars of pickled scapes on the pantry shelves. You were a truly amazing, inspirational and beautiful person. As a gardener I’m sure you would understand this unconventional tribute. 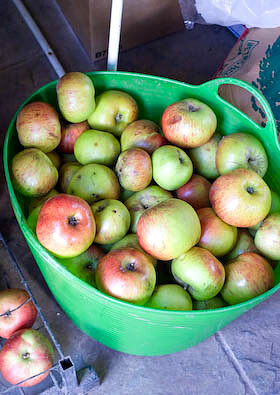 Month eleven, already the penultimate month of Tigress’s can jam canning challenge and for November the ingredient chosen by the talented artisan preserver Confituras aka blogger Cosmic Cowgirl is apples, pears and quince, a versatile selection of orchard fruits with delicious potential. I could find a gazillion uses for each of these, but have chosen luscious quinces for this canjam contribution. 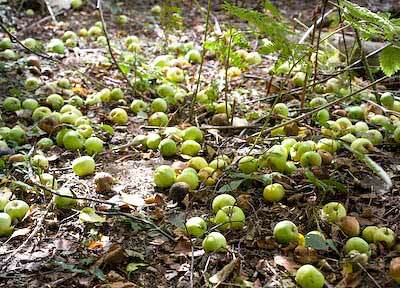 A few days ago I used up the last quince of the year. I always vow to bottle plenty and never seem to achieve my ambition. 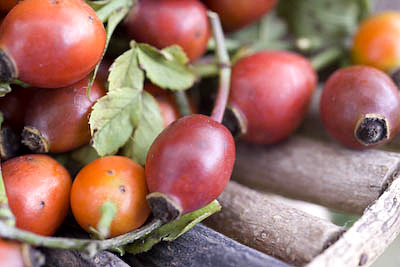 Once this fruit grabs you, you are totally smitten. 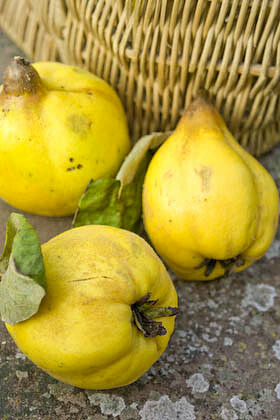 Considering how fab they are it surprises me that quince aren’t more popular; they are still seen as an unusual fruit. 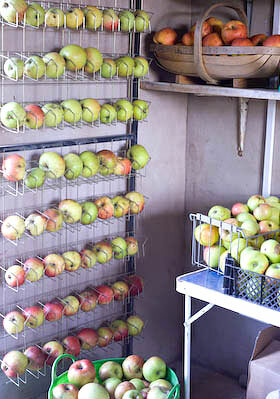 You have to seek them out and may find a supply at a farmers market, otherwise you need your own quince tree or to know someone else who has one. 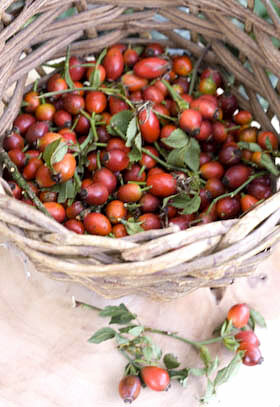 They take at least 5 years to produce fruit by the way if you are thinking of planting one. They are one of the few fruits that I love so much, I’d pay real money just for a whiff of, never mind a taste of, each year, though this time was lucky enough to find a supply for free when someone kindly advertised quinces up for grabs on the local Freecycle. I moved at the speed of light to get round to that house, believe me. 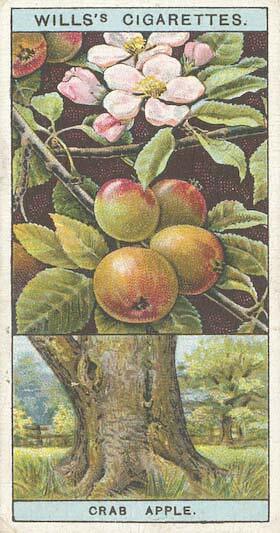 These Freecyclers had 2 trees heaving with fruit, that were so laden they had had to be propped up with stakes and ropes. 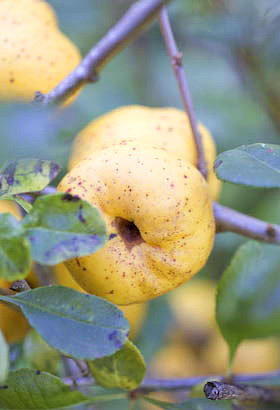 It gave me the opportunity to see quinces growing on the tree for the first time and to notice what untidy trees they are to produce such exceptional fruits. Of course, one of quinces magical qualities, apart from the wonderous unmistakable scent, is the way a hard unpalatable fruit turns delicious at the same time turning such a wonderful shade of deep ruby red as it cooks. I’m generally of the mind that long cooking times are of no benefit to ingredients, but quince turns this notion on its head. You need to slow cook ’em and slow cook ’em till they change colour, which can take 3 – 6 hours. 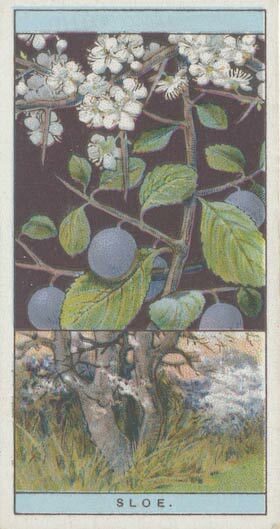 As regards the pantry, I want a supply of quince in spiced vanilla syrup, as straightforward as that. This is when canning makes such perfect sense and in theory allows you to preserve such a fabulous ingredient to last you all year round till the next time, though I haven’t managed that thus far. Preserving enough quince in jars is my ambition. 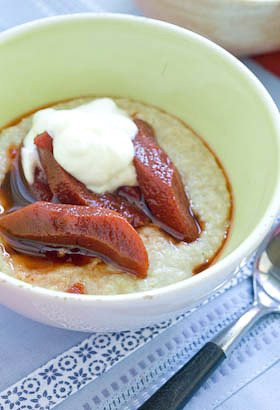 A favourite way to serve them, on oatmeal porridge with Greek yogurt for breakfast. As simple as that. 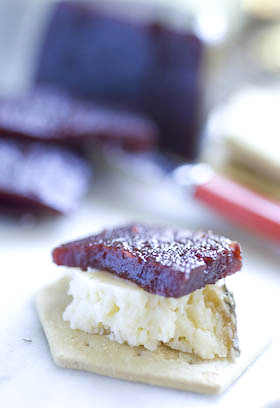 To prepare, they are quite hard work to peel and cut, so don’t expect elegant slices. 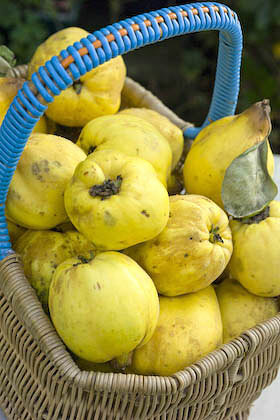 Scrub the quinces to remove the fuzzy coating. Peel, quarter and core the fruit. Cut each quince quarter into 2 or 3 slices, depending on the size of the fruit and immediately drop them into a bowl of acidulated water (water with some lemon juice added, as they discolour very quickly if you don’t). 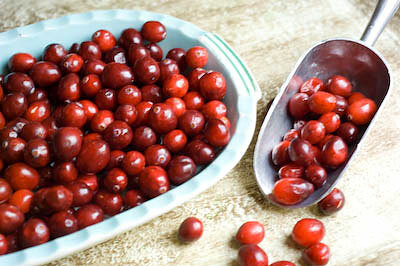 You can put peel and cores in a pan, cover with water and simmer for 4 hours, topping up with more water if necessary, then pour into a jelly bag, collecting the juice that drips through overnight. You can use this juice to top up the syrup if you find you need more to fill your jars and use what is left to make quince jelly. 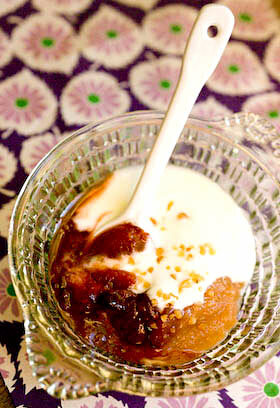 I also put the pulp left in the jelly bag through a food mill to make a quince puree, so nothing goes to waste. Preheat the oven to 110 C (225 F, Mk 1/4). 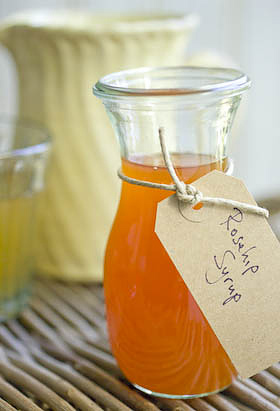 Make a sugar syrup by heating the water and sugar together, stirring until the sugar has dissolved. 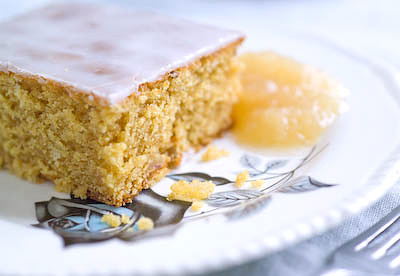 Drain and place the quince slices in a large ovenproof casserole, adding the cinnamon stick, cloves, a few pieces of lemon peel and the vanilla pod, after splitting it lengthways and scraping and the seeds out from the middle. Pour the syrup over the fruit and spices. Put the casserole on the hob and bring to the boil then remove from heat. Place a lid on the casserole and cook in the oven for 5 – 6 hours. Another way to cook the quinces is to use a slow cooker. Place the quince, spices and hot sugar syrup in the slow cooker casserole and cook on high for the first hour, then turn down to low and cook for 6 – 8 hours, by which time the fruit will have turned a deep red wine colour. Fill hot jars with quince slices, distributing the spices and vanilla pod amongst the jars and top up with syrup, leaving the required headspace for your type of jars. De-bubble, to remove air pockets, wipe the jar rims clean then seal and process for 15 minutes. Remove from the water bath and leave till completely cold before testing the seals and labelling. Toast the oatmeal in a pan for a few minutes, stirring with a wooden spoon until you begin to smell the toasted oat aroma. Add the water and salt and bring to a simmer, then cook for 20-30 minutes until thickened as you like it and cooked through, adding more water if necessary. That’s all there is too it! BLACK CHILLI JAM – WHOAH! Month ten Tigress’s can jam canning challenge and for October the ingredient chosen by Kaela at Local Kitchen is chili peppers and all things capsicum. 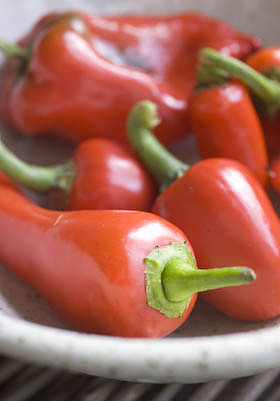 I admit, when the October ingredient was revealed, I wasn’t a gal who could tell a jalepeno from a habanero, but another month, another brilliant opportunity to explore and find out what chillis are all about and to recognise what’s hot and what’s not. As luck will have it, I didn’t have to go very far from home to do my research as growing chillis and peppers seems to be a very popular thing these days, so several friends right on my doorstep have provided the raw materials. 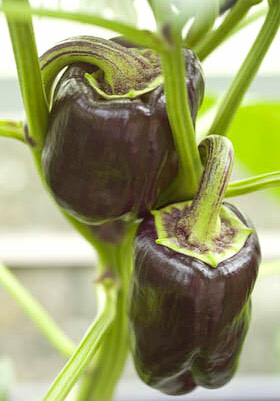 With a greenhouse or polytunnel at your disposal, capsicums are a seemingly easy crop to cultivate. 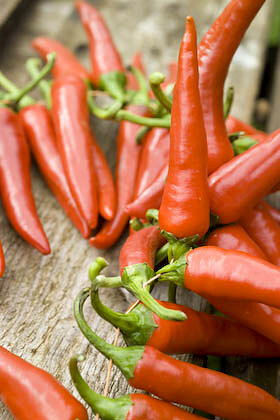 You can also grow chillis as potted plants on a windowsill. As is always the way each month, I read every recipe I could find for inspiration. With its orangy-red transparency flecked through with tiny pieces of red pepper, chilli jam holds a dazzling attraction for me, but as Morgy, next door, had given me a big bowl full of black grapes, from the vine that scrambles over the front of his rustic shed abode, I decided to use them to form the main carrying jelly for my hotter ingredients. If you haven’t got a supply of fresh grapes you could extract the juice from apples instead or I imagine that bought grape juice would work too. The other main ingredients came for free as well; sweet red peppers plus a purple one from my friend Shelley’s greenhouse, cayenne chilli peppers grown in the Taurus market garden. Cayenne peppers are only moderately hot, you could tell this as some little creature had been eating them in the greenhouse, chewing away at the stem end and leaving the pointy ends intact. I guess this to be a mouse called Miguel, wearing a sombrero and playing maracas. 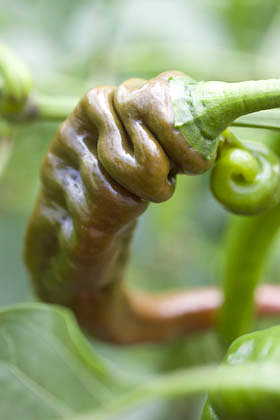 It goes to show that one end of the chilli is hotter than the other and that mice round here are made of stern stuff. So, after extracting the black juice from the grapes this jam was starting to take a different course from the norm. I remember ‘experiencing’ a sculpture once at Tate Modern by Anish Kapoor. It wasn’t a particularly amazing looking piece, just a box painted black and slightly taller than a person. As you stepped up to a line drawn on the floor and looked within, it suddenly felt as if you were about to fall into a void or abyss and the feeling was so strong and unexpected that it made you recoil and say ‘whoah’ out loud. Anyway, that’s what this chilli jam is like, a sticky homage to that Anish Kapoor work, a jam so black when you peer into its dense glossy richness you have to hang on in case you fall through into an alternative jammy universe. Place the grapes in a pan and heat gently till the juice begins to flow. Once there is plenty of juice surrounding the fruit simmer for 20 minutes, stirring from time to time to make sure it doesn’t catch on the bottom of the pan and squashing the fruit with the back of the spoon. 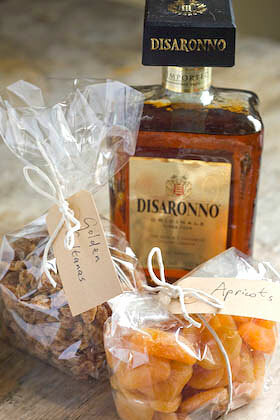 Pour the grapes into a jelly bag suspended over a bowl and collect the juice that drips through, leaving it to drip overnight. The next day measure the juice collected. 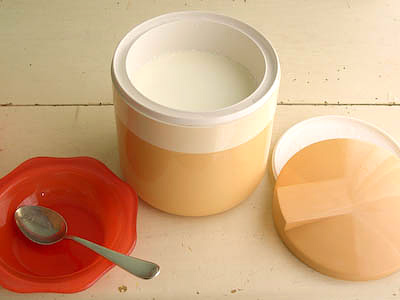 (You can also put the pulp that remains in the jelly bag through a food mill and use the de-seeded grape flesh you collect to add to another preserve.) I collected 700ml (3 cups) of juice but if your amount is different to this adjust the other ingredients accordingly. Prepare the water bath, jars and seals ready for canning. For more info about how to hot water process, refer to the guide here. Put the peppers, chillis and garlic clove in a food processor with half of the vinegar and blitz it thoroughly to a smooth sauce consistency. 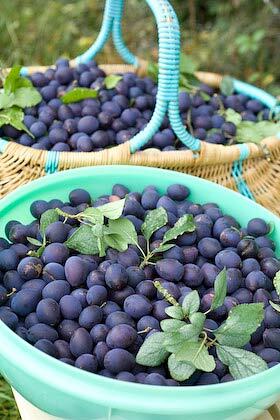 Pour into a preserving pan along with the grape juice, lemon juice, salt, remaining vinegar and chilli flakes. (Another way to adjust the heat would be to include some of the fresh seeds from the chilli peppers instead of using dried flakes.) Bring to a simmer and cook through for 10 minutes then remove from the heat to cool slightly. Add the sugar and stir over a gentle heat until the sugar is completely dissolved, then up the heat and bring to a rolling boil until it reaches setting point and a small dollop on a cold plate quickly forms a skin when you push your finger over the surface (it took me about 20 minutes). 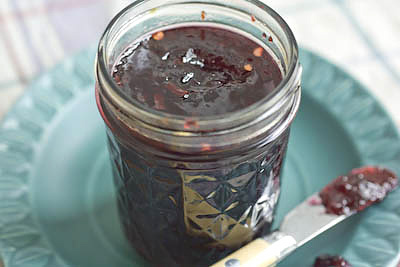 Turn off the heat and leave for 10 minutes, then stir to distribute the chilli peppers evenly through the jam. 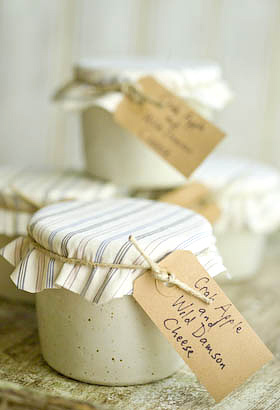 Pour into hot sterilised jars, seal and process for 10 minutes. Remove from the water bath and leave till completely cold before testing the seals and labelling. 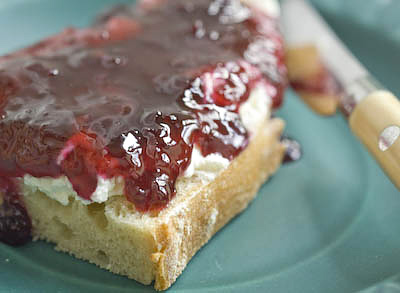 As this is a jam with good acidity and sugar levels, it should keep well without processing so long as you follow the usual guidelines regarding care taken sterilising jars. 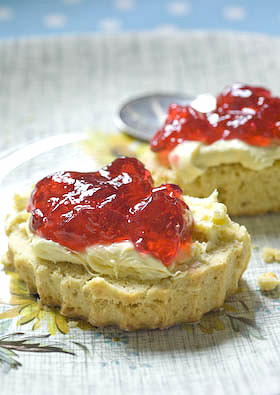 If you do can it you are making doubly certain that your jam will be preserved safely for a year or even longer.